Bad models can match the data very well, but good models make accurate predictions. A model's accuracy can be tested by comparing its predictions to an independent set of observations. Some of the Bible's predictions are testable. The main theme of the Torah is the covenant between God and Israel. Israel is given 10 Commandments and other statutes & ordinances, mostly civil and ceremonial laws. They were told that if they (as a nation) followed them, God would make them thrive in their new land. "Keep his statutes and commandments ... so that it may go well with you and your descendents and that you may enjoy longevity in the land..." (Deut 4:40). If they didn't follow them, the opposite would happen. Contrary to popular belief, they were not moral rules that one had to follow in order to go to heaven. In fact, an afterlife is never mentioned. Most were practical moral teachings, health and safety regulations, and criminal laws conducive to a successful nation. If the promise of the Torah was true, we should expect that on a large scale (not necessarily each individual person), nations that follow the Torah will thrive. Much of the rest of the Bible is about how things went well for Israel when they followed the Torah and went badly for them when they didn't. But the Bible is not an appropriate source of verification for predictions in the Bible. Instead, I'll turn to much more current and independent data. Gallup recently measured subjective well-being (i.e., how people feel about their lives) with the Cantril Self-Anchoring Striving Scale. People were rated as thriving, struggling, or suffering, based on their answers to various questions. I combined Gallup's results with religion data from Pew Research. Each religion was analyzed according to its number of adherents in each country and that country's respective well-being statistics. For example, 62% of Canadians were considered "thriving", so 62% of the 350,000 Jews and 62% of the 710,000 Muslims in Canada were counted as "thriving". The totals for each religion were then divided by their respective number of adherents, so each person counted equally. This method assumes that the overall moral/religious values of each country are consistent with the proportions of each religion there, which is appropriate given the national (rather than individual) scope of the prediction. For quantitative metrics, the Legatum Institute has done extensive studies on global wealth and well-being. The Legatum Prosperity Index uses a large number of variables and breaks the results down into several categories (see www.prosperity.com for details). I standardized the scores for each category. The results are consistent with the Torah's prediction. The Jewish population had the highest scores in every category except Economy. 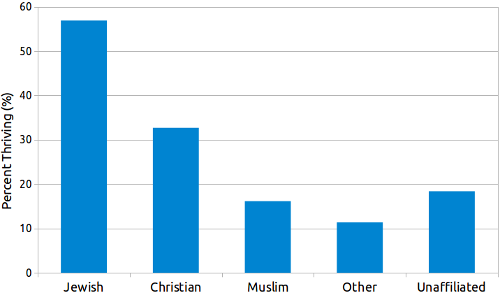 Christians, who affirm (but somewhat disregard) the Torah, had high scores despite relatively weak economies (mostly in Africa and Latin America), and had a high percentage that were "thriving". 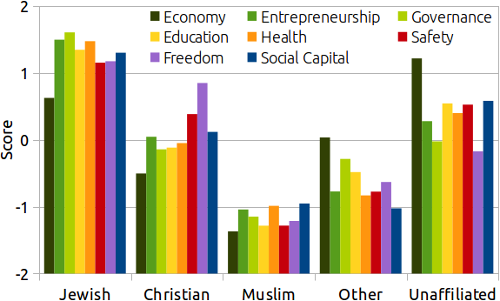 Muslims, who accept most of the Torah but reject some of the specifics, had low scores overall but relatively high scores compared to their economies. Populations that reject the Torah (Other and Unaffiliated) had low "thriving" percentages and low scores relative to their economies, though Unaffiliated had high scores overall on the quantitative indicators. We must be very careful not to read too much into these results. There are many possible explanations for them, and a causal relationship has not been established. Nothing has been proven. However, we can reasonably conclude that these results are more probable if the Torah promise is true than if it is false, which means it is positive evidence. If you start with a prior probability near 0% or 100%, evidence probably doesn't matter to you. But if you have a less extreme prior probability, I think this should move it a little in the positive direction. As a piece of objective evidence for the torah's predictions, this strikes me as a pretty weak one. My confirmation bias might explain that reaction, of course. Questions might be asked about the methods, and clearly any implication of causality for the results. I don't consider it "extreme" to have a very low prior probability and this "demonstration" wouldn't push that probability very much higher. Your mileage may vary ... but I like the idea of testing, so keep on keepin' on. Thanks Chuck. I agree that it's not "extreme" to have a very high or low prior probably if it is justified. I just meant "extreme" numerically, as in the extreme ends of the 0-1 probability range.